Swamp Ash for a Body? Re: Swamp Ash for a Body? Is there any good evidence that would support choosing a solid body electric guitar's body wood based on expectations of how the amplified guitar will sound ? No. Is there any good evidence that would support choosing a solid body electric guitar's neck / fingerboard wood based on expectations of how the amplified guitar will sound ? Maybe. The physics of frequency cancellation / no influence / enhancement can't be readily predicted. That 'lovely' resonance that one may feel in a neck may be simply deadening certain notes. So there is a school of thought that the ideal role of an electric guitar's body and neck is simply to "get out of the way" ... to be as inert / non-resonant as possible and thus remove the possibility of any influence (positive or negative) on string vibration. By that argument a guitar that feels and sounds acoustically dead in your hands / ears would actually be the safest bet. This is basically what the inventors of the electric solid body guitar had in mind - a mostly inert structure that could be amplified to play loud enough to be heard with other instruments, but would not resonate so as to create feedback. Overall I agree with you. "Tonewoods" as used on acoustics are meaningless in an electric context. But I'd be dubious about science that says a complex system doesn't react in a particular way, on the basis of a single E chord. But I'll leave it there. If I were building a replacement for my 52 Tele, I'd still buy a body made of similar wood. The sceptics who had always argued that of 'of course Stradivariuses are better' nit-picked the early studies as not sufficiently 'representative'. So new studies were done under different conditions, but the results in favour of the newer violins were basically the same. This is valuable science but it's nonethless trying to apply objective criteria to a subjective phenomenon. It's useful, but if players have dreamt about a Cremona violin all their lives, and obtaining one inspires them, that is surely a good thing? I recognise that there is much wrong with obsession with brands and marketing, in our materialistic society. But on the most fundamental level, our own bodies, there is proof that placebos work. US medical blind tests, in particular, have to normalise for the fact that the poeple taking placebos do better. A doctor friend told me at Christmas about a promising treatment for a liver complaint, that involved cauterising some cells. It plainly worked. Then later they found that simply opening up the patient, inserting the cauterising probe but not doing anything, seemed to produce exactly the same effect. Anyway, this is sufficiently OT. For a JM I'd get an ash body if I wanted it blond, and I'd look for a light one regardless of tone. Totally agree. There is a nice quote in that Stradivarius article .. The finding also leaves open the possibility that Strads do sound better than modern instruments under certain circumstances—when the listener knows they are hearing a legendary instrument. "If you know it's a Strad, you will hear it differently," Fritz says. "And you can't turn off that effect." We're just lucky that the guitars we crave don't cost millions like Stradivariuses do. So if someone is convinced that only swamp ash will sound the way they want, then only swamp ash will do. I just hope for the day when fewer people will think that way. The quest for sustainable woods is what may force the manufacturers to get us there. And maybe more good science. It's a pity with CITES that manufacturers are just saying "we can't ship traditional wood A internationally anymore, so we're going to make guitars with this wood B you've never heard of". Instead of saying "Here's a pile of sound samples with wood A and wood B .. try to pick the difference (after which we'll tell you which was which). You can't hear any difference ? Well that's the wood we'll use then." It's a missed opportunity. And so instead we'll probably see people saying on forums "I don't like the sound of Pau Ferro fretboards as much as rosewood". That's the sort of blind testing that manufacturers should be putting out for new solid body electric guitar woods. I don't really think that'll work. Countless times we've had guitar companies come out with "We've come up with this synthetic material that sounds even better than traditional wood" and they end up having a few fans but never really taking over the market. Heck, you could tell me a Parker Fly is provably better than any Jazzmaster in every way and you wouldn't catch me with one. What might work is paying some famous musicians to very publicly use Pau Ferro fretboards. I don't even think it's a guitar thing, I'd say musicians in general are pretty traditional, quite superstitious, and a bit fickle. There's always been a big element of prestige in owning instruments. Heck for violins, the provenance of an instrument is almost as important as what it actually sounds like. Pau Ferro is a truly wonderful fretboard wood! The equal of ebony in my opinion. I think a lot of people mix up the physical and the botanical characteristics when talking about “tone” woods. For instance, if someone compares alder to swamp ash, are they choosing two pieces with the same density? Or might it be the case that if you compare a light piece of alder with a heavier piece of swamp ash, the light alder will have those “swamp ash” characteristics? It’s sexier somehow to say “this species of tree is the best” than it is to say “its density is just right in the medium / lightweight range”. Because a company can sell you the former in absolute terms instead of relative terms like “medium lightweight “. What’s more, you can see the species and you can’t see the weight, so naturally that will be used in advertising since it’s a visual medium. Moreover, seeing that one guitar is made from a different wood than another (like with maple versus rosewood fretboards) it begs the question “why”? And no salesman worth his salt is going to say “because Leo Fender decided the maple boards were looking too ropey after a few years”! He’s going to frame it as a connoisseur’s choice, a matter of taste and learning that really says something about the prospective buyer! Which isn’t to say these things don’t make a difference. I believe they do, but it’s important to remember that even if it didn’t make a difference, people would still say it does. Anyway, to guitar nerds like us a maple neck (for example) means more that a visual choice. Hell, it means more than a tonal choice! It’s tradition, history, it’s an era, a state of mind. It has meaning! When I design guitars I’m not thinking just about how it looks, plays or sounds. I’m thinking about what it means to me, what it could mean to others. This is the difference between trifling good looks and true aesthetics. The preoccupation we have as regards wood species leads many to overlook much more important stuff, like geometry. Geometry is really the most important thing to what your guitar’s doing before it gets to the electronics. Where the string tension is going & what it’s anchored to, break angle, how stiff or flexible your neck is, where the neck joint is in relation to the string length, where the pickups are in relation to the string length, scale length, how close your pickups are to the string, how high is your action, neck relief, string gauge. Some of these things are obsessed over by guitarists at large, others are not. In my opinion, all are more important to the sound and feel than the species of wood it’s made from. Unpotted humbuckers, essential in the neck position at least. IMO there are too many flaws in the popular approaches to this subject for any findings to be definitive. Most of us know that a rack of same model guitars all sound a little different, and some sound better to us than others. We may assume that the wood is the cause, which would indicate that the wood can make a sizable enough difference to matter. Or we may write it off as other differences, staying in the camp that holds the wood as being insignificantly impactful to the sound. Some of us know that pickup A sounds different in guitar B than it sounds in guitar C.
We may even have a sense of where a bright pickup would sound better. Again, we make our judgements and nothing is proven to anyone else. The big flaw to me is the idea that a third party can judge a tool by the product made with the tool. When we play we articulate to suit our ear. Most of us can make a bright guitar sound darker or soften the attack of a hard sounding guitar. Further, when we compare very similar sounding body woods, like swamp ash and alder, the differences are as great between samples of the same species as they are between one species and the other, yet we so often choose these two woods to compare. And of course if we try to make such a test fair, we will choose the same weight alder and swamp ash bodies, which commonly sound very very similar, if not effectively identical in terms of the players ability to instinctually hit their target tone. Alder can be found to be very soft in it's lightest weights though, and those samples might regularly have notably different tone and attack from ultra light swamp ash which remains hard and stiff ta its lightest weight. Choosing to conclude that density is the determining factor sounds reasonable enough, yet density is only coincidentally related to hardness or stiffness. You could soak a piece of pine in water and increase the density, but it would still have the same basic hardness and stiffness. Or moving away from the aggressive obviation of such a ridiculous comparison, we might choose to compare basswood and swamp ash bodies of the same weight. IME basswood has a more softened attack than swamp ash, and this to enough of a degree that I can't get what I want with a basswood body in terms of the attack and clarity in the bass range of a guitar. Back to the ridiculous conceptualization, basswood "sounds" to me like pine soaked overnight in a bucket of water. With some compression and/ or distortion I might not hear or feel the difference. Some players do though, or claim to. In order to determine any difference in what the wood does to the sound, we need to eliminate the difference in what the player does to the sound. One way to do this would be to eliminate the player, and replace us with a mechanical string striker. The method I use is to avoid middle responses, where I can add or subtract treble and attack by picking differently. Instead I do something like set the amp too bright and pick for a pleasing fat tone. A tone I can barely get at that setting with that pickup. Swap only the body and note which setup gets closer to the tone I want. I cannot remember two similarly pleasing sounds, but I can more easily remember one as being satisfactory while the other is unsatisfactory. Had I set the amp for a middle of the road sound I would likely have not heard much of a difference once my instincts moderated the resultant sound. Another method is less specific, where I listen for bass clarity and attack; I want access to a sort of grand piano bottom end. Basswood might get an almost indistinguishable tone from swamp ash, but be unable to deliver the crisp attack and clarity. This unsatisfactory attack of most basswood bodies I swapped around cannot IME be mitigated with SC pickup swaps. I suppose though that since HBs seem to have a wider range of attack characteristics, and since HB players choose a more compressed pickup response, it's possible that a HB/ basswood player can tailor their bass tone and response just fine within the range of what the pickups can do. It's also likely that if you compare through an amp that lacks bass clarity, you will have a hard time judging the bass clarity and attack of the guitar. IME typical guitar amp tone favors softer bottom end, and not many guitar amps are able to make the bottom strings terribly clear. Even the bigger BF/SF Fender 6L6 amps known for cleans have a softer bass, not really capable of extreme bass clarity. So IME, using fairly low wind bright SC pickups with alnico V pole magnets, I have several basswood bodies that have seen numerous neck, bridge and pickups combos but never satisfied my particular expectations of clean wound string attack and clarity. Between light weight swamp ash and light weight alder, any very very subtle differences are easily enough mitigated by technique. At the same time though, I have a few heavier swamp ash and alder bodies that never quite made me happy, so they sit in the pile on the bench. They all work though, and are not as annoying as any basswood bodies I've run through the parts swapping mill over the years. I've tried to like a basswood body with a great deal of effort too, one in particular being an '85 MIJ PP Tele. Swapped necks, bridges, saddles, pickups, pots, shims, all the while assuming it was alder under the wallpaper. Found out eventually it was basswood, which I had never noticed in the unpainted pocket. Tried a few more years to like it and it never happened, even though I love the guitar. WRT the idea that a resonant body has more sustain, or that the strings vibrational energy goes into the body and then is given back to the string in the form of increased sustain; that is IMO too funny to even discuss. It is worth noting though that a more resonant body is more easily driven by the amps speakers, thus might be observed to have more feedback based sustain at a reasonable volume that a heavier harder body. This is a whole nother bit of science though, legit to the player but not to the narrower scientific comparison. Finishing it compared to alder is more work as you need to fill the grain (very porous) - sometimes two runs of grain filler is necessary. I always find that it often needs more sealer and primer too to cover rogue grain! Alder you can pretty much sand and put a few coats of sealer/primer on it and ha e a very workable flat surface. Sound wise... hard to say. But personally I’ve had some great sounding swamp ash guitars and some ones that have felt quite flat. Obviously lots of things at play other than body wood. Other people may have more useful input about this, but I think sound comes largely down to setup, pickups and playing. 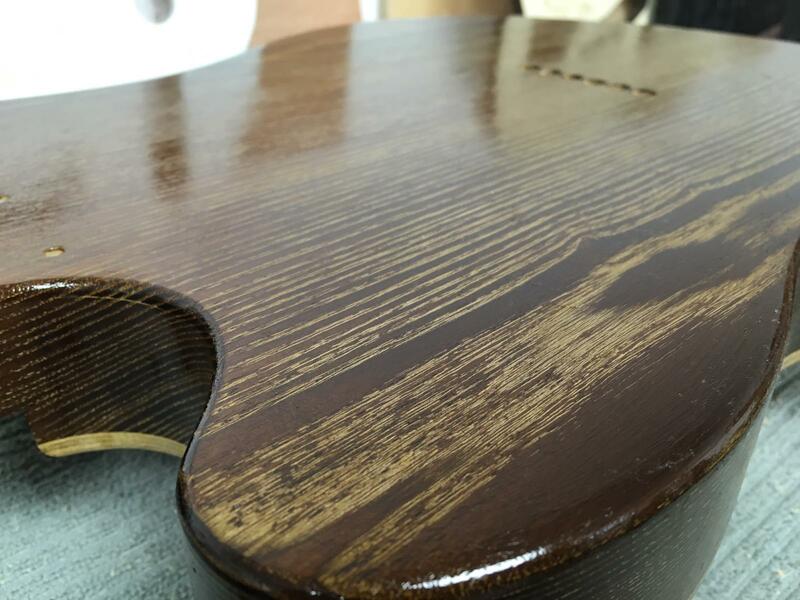 The need to grain fill swamp ash or ash is correct in terms of finishing convention, but incorrect in terms of practical use where the OP wants a clear finish for the looks. I've clear finished numerous swamp as bodies, never used a filler product, and they all look nice, even flat. A solid color might show grain texture a little though, which either filler or more coats would mitigate. 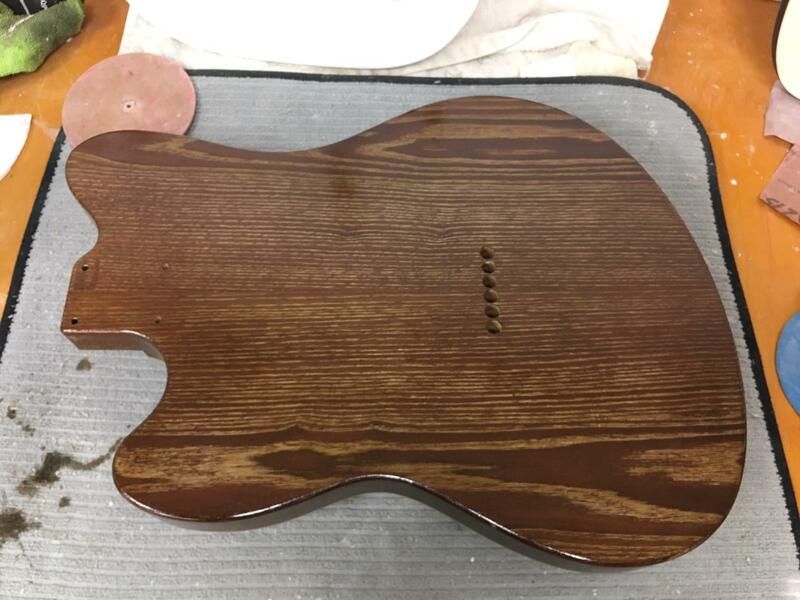 In a way, swamp ash is easier to hobby finish than alder, because the uniformity of appearance of alder makes it need a more perfect finish, where the patterning of swamp ash looks nice more easily IME. But for a solid color, yeah it's fair to say it needs grain filling. I would not choose ash for a solid color, but I like nice looking wood to show. Here the OP did say he wants a clear finish to show the grain, and IME that's a pretty easy home project to get professional looking results with. I'm doing Tru-Oil on a roasted swamp ash JM body right now. There are a few spots like the upper horn where there's some "wavyness" that couldn't really be sanded out (at least not with the tools and skills I have), so it's going to have a little bit of a rustic look since I decided not to do any grain filling. The other thing people do sometimes is rub Tru-Oil in with synthetic steel wool which makes a slurry of sawdust and Tru-Oil that fills the grain a bit. I'm not bothering with that as it seems messy and I'm not going for a super flat finish. One really nice feature of the roasted swamp ash (in addition to being lighter) is it's "pre-stained" and the color is deep and even. I did consider staining with india ink and sanding back, but I'm glad I decided to just leave it natural. Yeah, exactly. 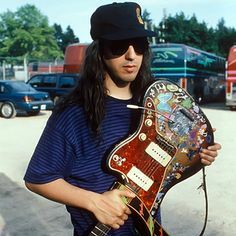 I'm building a Costello inspired guitar with water dyes. I just don't know if ash or alder is the better choice given the grain will be visible. I don't like bright guitars, so ash having that reputation makes me lean alder. But ash does have nicer grain. 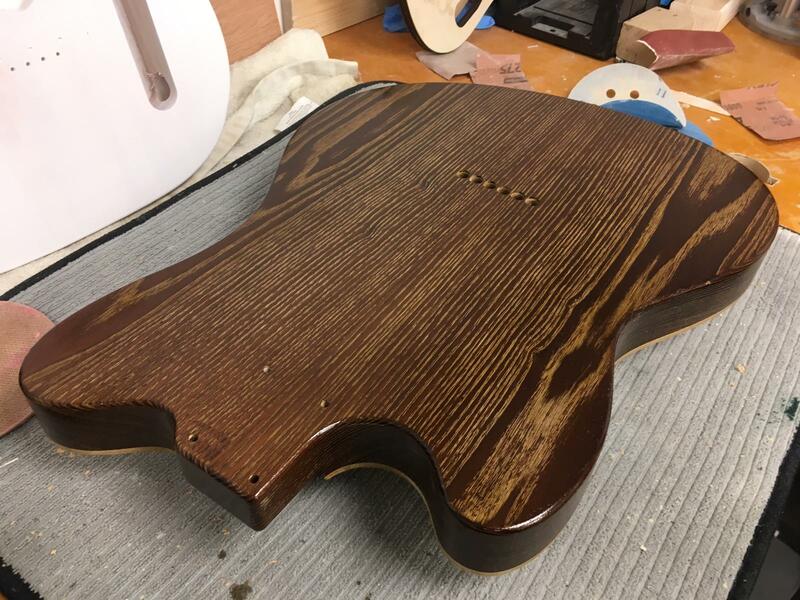 Agreed, I use a lot of heat treated Ash, Poplar and Maple and Rexter sent me these pics of an ash bodied thinline after grain filling with shellac that sent the grain this great warm gold colour. I think it really contrasts nicely with the dark brown timber. I hope you don't mind me sharing this here, Jon! This one has actually now got an awesome copper mist finish that looks great! Even though this looks wonderful, It's in no way representative of the incredible work Jon does since it's just the filler and undercoat before any sanding I believe. In addition to the physics of woods and bridges etc, an understanding of how pickups operate, and their potential for variation, is also fundamental to judging why solid body electric guitars with the same nominal components sometimes sound different. Unfortunately we don't have much objective data on that variation. So we perhaps falsely assume that their magnetism and construction must have more consistent properties than wood, and therefore look to the latter for tenuous explanations. But pickup manfacturers do not provide any proof such as an amplitude-frequency spectrum to prove that each pickup has the same performance in a standardized circuit with standardized drive, like for example speaker manufacturers do. Nor are things like pickup height often standardized when differences are heard. As physics and empirical experiments tend to suggest that wood has little influence on sound in a solid body electric, we should be looking harder elsewhere when we hear differences. My gut tells me here that a solid body guitar is way too complex of a system to isolate to a single tree species. You can get ten different Strats (or whatever) from the same lot, build them up at the factory and they all sound and play subtly different...to where one of them is awesome, three others are very nice, and the rest are meh. In terms of the vibration profile of each guitar, there are many interactions between density & stiffness variations across the body, neck, screw and attach point pressure, string tension, etc, on an instrument that is vibrating across many decades of frequency, with all kinds of harmonics and cross-products...I would think that "happy coincidences" have more to do with ending up with a great guitar (vs merely a very good one) as intent and method and materials...that is, the materials and build technique are necessary (to a point), but luck plays a very large role. how did it sound compared to the more traditional alder? I've got it in my head that I want an Olympic White JM but without binding so I'm looking at bodies. There are no light alder bodies out in the world right now (easily available at least) - but you can get 3.5# swamp ash. (Neck/trem/bridge/etc. comes in a hair over 4 pounds, so a 3.5# body makes for a 7.5# guitar and my JM that weighs that much feels perfect.) Tradition tugs at me to keep looking for alder... but I don't really believe in tonewood and in any case even without using a fuzz how much could it matter compared to sweeping the mids knob on my amp? 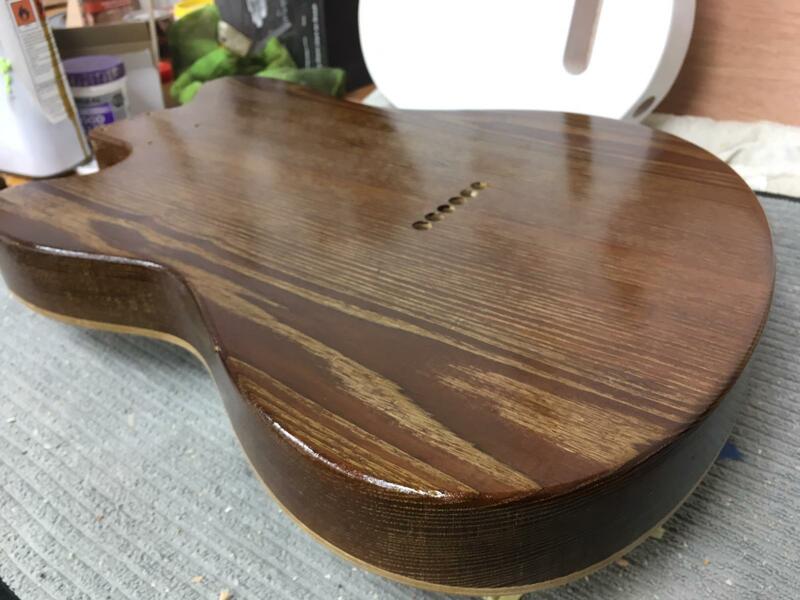 If I'm making a Costello style JM with water based dyes that will show the grain, would I use the dye first to get the color I want, then go over it with the filler, and then put the final clear coat on? I'm having a hard time finding online at what stage to put the filler in. My instinct was to fill it first, but from what I read many people say dye doesn't take to the filler.